From Goodreads ~ Yoga instructor Kate Davidson tries to live up to yoga's Zen-like expectations, but it's not easy while struggling to keep her small business afloat or dodging her best friend's matchmaking efforts. Kate has recently opened a yoga studio and is barely getting by. It doesn't help when a homeless man and his large German Shepherd, which doesn't like other dogs, starts selling newspapers outside her door. Instead of freaking out, Kate does the Zen thing and befriends George and Bella. When George is killed, the police assume it was during a fight among the homeless and don't put a lot of effort into finding out who the killer is. But Kate can't let it go and starts investigating on her own and comes up with a list of people who could have done it. In the meantime, to save Bella from going to the pound (and probably put down), she takes her in until she can find her a home. But who is going to want a large German Shepherd with behavior problems and health issues? This is the first book I've read by this author and I liked it. 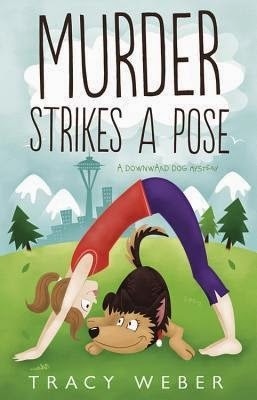 It's obvious the author wrote from experience ... she has a yoga studio and a German Shepherd named Tasha. I liked the writing style. It is written in first person perspective from Kate's point of view. I liked Kate. She's still struggling with the death of her father a couple years ago. Despite the fact that she is a self-professed crazy cat lady, she takes Bella in and tries to find her a home ... with patience, she does eventually find Bella the best home. Kate has a good heart ... though she only has $4,000 left to her name, she doesn't hesitate to juggle her needs with those of Bella so Bella can have the medicine, food, training, etc. she needs. And I love a story that has a dog! Bella sounds like a great dog! Other supporting characters include her best friend, a new love interest (a pet store owner) and a slimy landlord. This is the first of the series and I look forward to reading others. Thanks so much for sharing your thoughts on this 1st in series cozy mystery. Sounds like fun! Teena, thanks so much for reviewing MURDER STRIKES A POSE! I love Bella, too! ;-) Also thanks to Lance and Masshole Mommy! I hope you both read and like the book!